A hot towel shave is a great experience. 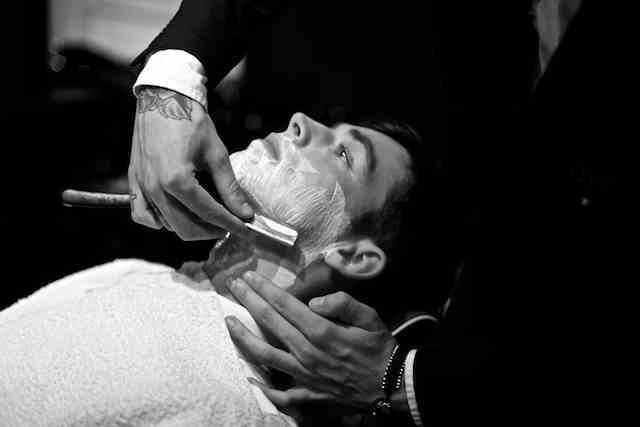 Not only to you get a closer shave with the cut throat razor, it also helps with exfoliation and applying rehydration.The shave is much closer than you are likely to achieve in front of the bathroom mirror, and most men regard it as their own version of a skin maintenance programme. We know so much more about the science of skin, that the traditional barbers shave that we provide at The Hub has a few modern twists to it. The Hub have added a few extra steps to the traditional shave incorporating skin techniques borrowed from the beauty industry. During the Shavel (a shave mixed in with the basics of a facial) we use high quality products to cleanse your skin, then use an exfoliating scrub to slough away dead skin cells, and to help soften the bristle and lift it up for a closer shave. Hot towels are applied followed with a creamy skin conditioning shaving soap, and a cut throat sterile razor (new blade for every customer). After your shave we finish with a top brand cooling post shave lotion and moisturizing cream. During the traditional barbers shave, the blade removes up to 4 layers of dead skin cells – so it is like an exfoliation treatment. The shave itself is especially good for getting rid of in-growing hairs as the cut throat razor literally pulls each of them out. You will see blood spots (they are little spots of blood caused by pulling the root of the in-growing hair out) during the shave, but after the shave is finished the bumps created by in-growing hair will subside. Regular barbers shave trains your skin and allows you to get closer with your own razor. Your skin becomes resistant to irritation from razor burn, and you are able to shave against the direction of the grain without the fear of causing razor bumps. or ask us a price for your combination.